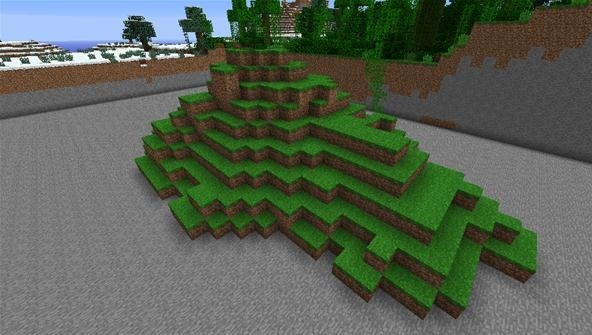 There are three techniques that you want to consider when constructing a mountain in Minecraft, and when you combine all three of them, you'll end up with great-looking terrain! In this case, regular doesn't mean 'normal', it means 'symmetrical'. Real mountains only have partial symmetry... if you make them too regular and symmetrical, they look entirely artificial. 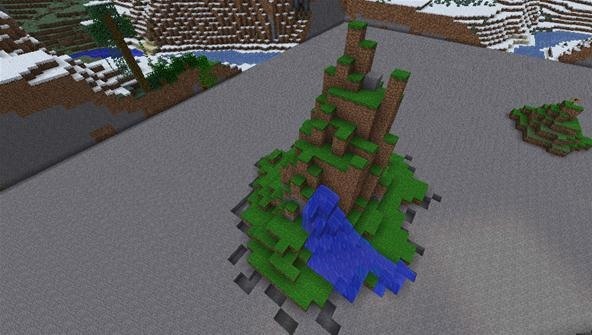 Note that in the above picture (mountain made by Freakje118), the base isn't a circle, or an oval, or any other recognizable shape. It's uneven, and lumpy, just like the mountain itself. That's what real mountains look like! 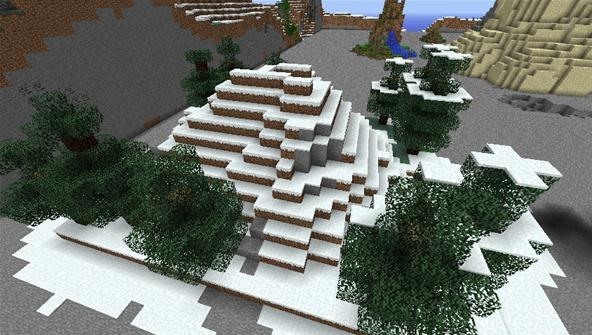 This snow-covered hill by Wakafanykai123 is regular in height (each level is one block-height above the next), but irregular in shape, which is why it looks more natural. In the above picture (by Prospero13), you can see how the blocks rise much faster upward than inward, and the jagged peaks look natural and organic. The terrain above, by Pmaguire, isn't really a mountain, but more of a wide hill. Its irregularity makes it look natural, but it's not really a mountain unless it rises more. Generally speaking, you don't want lots of hard corners in your landscapes, because hard corners don't often occur in nature. Corners are worn down by erosion, which is why you don't see too many of them. Granted, all Minecraft blocks have sharp edges, but you can still smooth them out a bit. The jagged peaks work in this small example that we previously showed, but they do not look as good in large-scale construction. In the above picture, even the sheer cliffs of the mountain are softened and smoothed out to create an organic look. 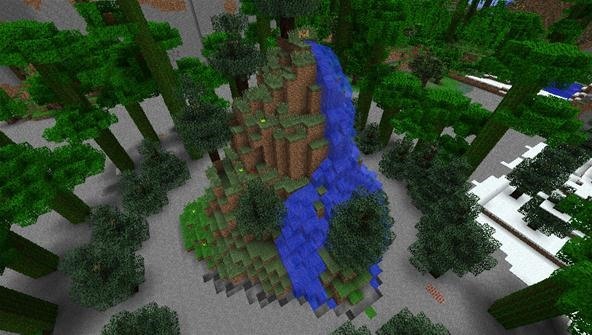 The river and trees help make it look more natural as well, but without a solid base, the trees and river will look strange and out-of-place. All of the above pictures are of mountains that were built during our workshop, which was only an hour long. So while placing a mountain block-by-block is time-consuming, you can see that it's certainly doable! I hope that this is helpful for those of you who like the idea of incorporating natural terrain into your builds! PEMANDANGANNYA AMAT MENAWAN DAN SESUAI MELANCUNG DI TEMPAT SEPERTI INI..
damn i missed this :( when was it? and are there going to be anymore similar things at the same next week?